Practical music teaching in England, delivered by a network of 121 hubs, is secure for another four years, ministers have announced. The hubs, first set up in 2012, allow children to play instruments, sing in choirs or play in bands, but continued funding has been uncertain. Now the government has announced £300m to last over the next four years. The Musicians Union said the cash would be welcome relief to music teachers “struggling” in insecure jobs. Composer Lord Lloyd-Webber said it was a “welcome first step towards improving funding for music and the arts” in schools. But the NASUWT teachers’ union called it “a sticking plaster to cover a gaping wound”. Music education hubs work with schools, local authorities and community organisations to encourage more children to take part in music and the arts. The government spent £271m over the past four years, so ministers say the latest injection of cash represents an increase and will allow the hubs to reach even more pupils. “Music and the arts can transform lives and introduce young people to a huge range of opportunities,” said School Standards Minister Nick Gibb. He said the aim was to ensure that “opportunities are open to all, not just the privileged few”. £13.5m a year to subsidise fees and living costs for students aged 16 to 23 at other high quality dance and drama schools. The Musicians Union says the setting of the hubs in 2012 coincided with cuts to local authority music services, with instrumental teachers suffering job losses and pay cuts. The new funding “does not redress local authority cuts”, said MU national organiser for education and training, Diane Widdison. Ms Widdison also highlighted concerns that music and other arts subjects are being sidelined in schools. Campaigners fear that arts subjects are being squeezed off the timetable because they are not included in the Ebacc school league table measure. EBacc rates schools on how many pupils achieve grades (A* to C) in English, maths, the sciences, a language and a humanity. 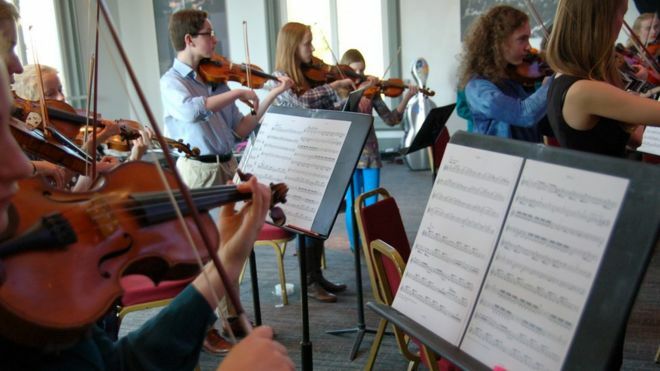 The measure was introduced in 2010 and the number of pupils entering GCSE music has fallen from 43,200 in 2011 to 37,400 in 2016, government figures show. Deborah Annetts, chief executive of the Incorporated Society of Musicians, said she hoped “this recognition of the importance of music education leads to a reconsideration of the proposed EBacc which has been so detrimental to music and the arts”. She said the £300m investment was “great news” but urged the government to adopt proposals for a more creative EBacc in schools. NASUWT general secretary Chris Keates said schools’ focus on subjects that would affect their league table rankings meant creative subjects were being “relentlessly driven out”. Lord Lloyd-Webber said he looked forward to working with government to build on its commitment.